My thoughts on “MIRRORS”, the second album from Yanakoto Sotto Mute. By the time you guys are reading this I’m going to be super late to the party on this release. Though I suppose I’ve been late to the party with pretty much everything lately so maybe none of you will even notice. In any case, I figured it wouldn’t be that big of a deal if I held off on this review because surely a bunch of other people would be talking about it. I was under the impression that this album was hotly anticipated and pegged for AotY status before anyone had even heard it. Well, perhaps I thought wrong because for the past month or so since its release I haven’t really seen anyone talking about “MIRRORS” by Yanakoto Sotto Mute. Certainly far less talk than I expected for a group who put out what was generally considered one of the best albums of 2017 in “BUBBLE” (review here). They’re even flying all the way to America to perform at the East Meets West Music Fest in August (tickets here) and that’s still not enough to get you guys excited? Seriously? Okay, okay. Got a little bit too personal there, my bad. “Unprofessional opinions about Idols” and all that. 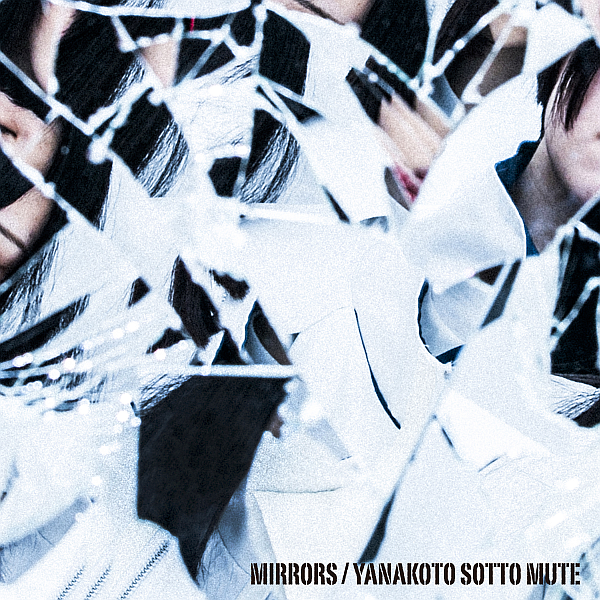 Anyway, I’m going to be reviewing Yanakoto Sotto Mute’s second full-length album “MIRRORS” this week. It follows “BUBBLE”, with their “STAMP EP” (review here) sandwiched in between, with several songs from said EP also featured on this release. I have no idea why no one is talking about it but hey, maybe I’ll find out once I start listening to it and start sharing my thoughts. Let’s do that now shall we? We dive right into some brand new material with the album’s first song “Louvre no Sora”. Not really sure what to make of that title but I think there might be a graphic novel with a similar title…though I doubt they went that deep on the references. This song starts off with some pretty great Alt-Rock style guitar, which serves as the backbone for much of the song. Lots of fun little riffs and things of that nature to keep the ears perked up for the 4 minute duration of the song. I also liked what they did with the interlude about 2 and a half minutes in. Vocally and Yanamute appear to be firing on all cylinders right out of the gate. Great melodies, high notes and over all vocal control while still retaining an element of rawness. Could have done with a slightly stronger hook but that’s just me being picky. Great start to the album. The album’s second track “Closer” is a rather brief affair, clocking in at just under 2 and a half minutes long. Given the short runtime there does feel like there’s a sense of urgency to the instrumental, with some quick tempo drum patterns being the driving force behind the song. I’m also rather partial to the fairly repetitive but almost serene sounding guitar riff that is an almost ever present feature of the track. Given the urgency of the instrumental, the song also provides Yanamute the chance to cut loose a bit on the vocal side of things with some very emotive and just downright impressive moments. This is the sort of thing the group has been experimenting with of late and I’m personally a fan of this development. Very much one of those “blink and you’ll miss it” songs but sometimes art should be fleeting, right? The brand new material keeps on flowing with third track “GHOST WORLD”, which does rather make “Closer” seem like more of an interlude by comparison. This song is pretty interesting in that the vocals and the instrumental seem to be at odds with each other at times. For much of the verses the vocals are fairly subdued and perhaps even melancholic sounding, while the instrumentals on this song are positively upbeat Punk tinged Rock. Quite the contrast. The chorus is where the vocals really come to life though, with some really catchy hooks and do I detect just a hint of a Shibuya-kei influence in there? No matter what it is one thing is for sure, I really like it. One thing to note that I probably should have mentioned earlier is that the the mixing on this song and much of Yanamute’s output is done in a more “standard” way of layering the vocals into the instrumental instead of on top. Just thought I should mention that because if anything sounds weird to you then that’s probably the reason. It takes us 4 tracks into the album before we’re greeted by our first previously released song. “HOLY GRAiL” was first released on “echoes” back in January, which I believe was a venue/digital only single that I neglected to review at the time for some odd reason. Quite the oversight on my part because this is a really good song. If you’re a fan of vocal harmonies then you should check this one out because man are there some nice ones here, they’re practically the stars of the show honestly. Though the chorus ain’t half bad either. The instrumental is in a fairly standard Pop-Rock style which achieves everything that it sets out to do without overshadowing the vocal performances too much. I’m probably selling it way too short saying stuff like that but it’s the best way I can think to describe it. The fact is we’re 4 tracks into this album and everything I’ve heard so far has been great. Why are you still reading this when you could be listening to these songs anyway? Despite its name, “No Regret” certainly doesn’t sound like the type of song that would bear such a title. The vocals contain some very nice harmonies, that is certainly a fact. However they’re presented with a fairly gloomy veneer that certainly makes it sound like there’s far from being “No Regret” involved here. It’s hard not to continue to be impressed by the vocal talent on show here, if only they had a crazy gimmick so people would take notice right? Moving on to the instrumental side of things and this one is a pretty clear cut Rock song, although they did throw a little bit of mud on the guitar to rough the edges of the song up a little bit. I have a fairly established top 3 to 5 favorite Yanamute songs but I think this song is making a very strong case for cracking into that list. If you’re looking for a couple of songs to check out to see if this album is for you then I would say that this is definitely one of the ones that you should be checking out. Things take a somewhat unexpected turn on the album’s sixth track “Reflection”. We’d already heard a slightly more Punk influence on a few previous Yanamute songs, both on this album and prior releases, and that influence is once again on show with this song. They never fully commit to it but you can definitely hear it in certain areas of the guitar work especially. I personally think it’s a good way to spice up the “typical” instrumental formula and works well with the girls’ vocals too. Speaking of the vocals, that’s where the unexpected turn I mentioned comes in. For the most part Yanamute’s vocals are fairly…restrained isn’t the right term but hopefully you get what I mean. Well, that’s far from the case with “Reflection” where the girls cut loose and get unrestrained and pretty raw at times. I love it personally as it creates a level of emotion that isn’t always heard on the group’s studio recordings. Another fairly short song at a little over 3 minutes but you’re definitely getting your money’s worth in those 190 seconds. We move back into some previously released material with “Any” featuring as the next song in the running order. This song originally appeared on Yanamute’s “STAMP EP” of which you can read my full review here. This is another favorite of mine, mixing Pop with elements of Grunge to create a song that has some really great energy. You can kinda tell that this one was created with live performances in mind when listening to some of the sections, something I feel like not enough groups take into consideration these days. Not sure why I said the song doesn’t have that great of a hook in my original review, perhaps it grew on me or I was just an idiot back then. It should be noted that they did ever so slightly rework this song from its original release but it’s nothing major and certainly doesn’t negatively (or positively I suppose) impact my opinion of the song. That opinion being that it’s awesome and you should go listen to it right now. Speaking of awesome songs, next up is “Tenki Ame to Sekai no Parade”. This song was also first originally released on Yanamute’s “STAMP EP” and once again you can read my original review of that release here. So for me personally this is my favorite of all of Yanamute’s songs. In fact I’d go as far as to say that if you don’t like this song for some reason then maybe Yanamute just isn’t for you. Like I said in my original article, I get some pretty strong SCANDAL vibes from back in the day with this song. It also does a fantastic job of showing off a bunch of different sides to Yanamute’s sound in a little over 4 minutes. Once again there’s been a tweak here and there for the album release but they stayed very true to the original, which probably didn’t even need anything done to it in the first place. I’m honestly baffled why this song isn’t used to promote this group as it’s just incredible to listen to. The run of material previously heard on Yanamute’s “STAMP EP” continues with “AWAKE” bringing us into the closing stretch of the album. If you still haven’t done so, you can check out my original review by clicking here of course. This is one of the few moments where “MIRRORS” strays into Ballad territory and in all fairness it’s a really damn good song for a style of music that normally doesn’t do too much for me in most cases. The vocals are very dramatic sounding with a lot of emotion poured into them, which is somewhat surprisingly complimented rather nicely by the gritty guitar instrumental they’ve used. The main selling point of this song is pretty obviously the crescendo and the climax that follows it and why not when it’s all executed as well as it is here. Like the other songs taken from the “STAMP EP”, this one too has had a very slight remaster but once again I don’t think it really adds or subtracts anything significant from what was and still is a really great song. For the album’s penultimate track we return to the “echoes” single that I mentioned near the start of this review. This time we’re looking at the b-side “Palette” and well, if “AWAKE” strayed into Ballad territory then this song steps off the path and starts sprinting headfirst into the woods. It’s quite a light, almost refreshing song in a way and maybe I’m trying to add some more personal positives but is that a hint of Dream Pop that I detect? In any case, the structure of the instrumental on this song is a thing of beauty with the way they layer everything together being pretty much spot on. Vocally is where much of the aforementioned light, refreshing feeling comes from with the lyrics seeming to float along in the breeze. A very pleasant and relaxing listening experience with enough going on to keep even this guy’s short attention span engaged for 4 minutes. The album’s final new song “Phantom calling” is also the song that things are closed out on. What a way to close things out too, with a proggy, Jazz flavored Rock song that is a bit of a departure from the kind of sound Yanamute are typically known for. It gets quite disjointed at times which works with the Jazz elements but might not be to a lot of casual listeners’ tastes. If you’re not that into songs with non-standard time signatures and some very abrupt transitions then you’ve been warned! I feel kinda bad because with everything that’s going on with the instrumental it did make it a bit difficult to pay attention to the vocals at times. It took quite a few listens before I could tear myself away from the instrumental and focus on what is another fantastic Yanamute vocal performance, full of great melodies and individual moments of vocal prowess. Talk about ending things on a high note. Well then, I think it’s safe to say that I like this album a whole lot. Sure there’s only 5 completely brand new songs but if we’re looking at it as a complete package then you have to admit that “MIRRORS” has a very strong case for being considered one of if not the best albums of 2018 thus far. The fact that hardly anyone in the West seems to even be acknowledging its existence currently makes no sense to me. Like I mentioned at the beginning of the review, Yanakoto Sotto Mute will be heading to Anaheim, California in August for the East Meets West Music Fest (tickets here). They’ll be joined by NECRONOMIDOL, Hanako-san and a bunch of other cool acts so if you’re able to please do consider going because it’s going to be awesome. It’ll also maybe convince Yanamute’s management to bring the group to other places too which would be nice, wouldn’t it?